Platelets require specific storage condition, for example, constant agitation at 20°-24°C to prevent platelet aggregation and bacterial proliferation  that minimizes the "platelet storage lesion" (PSL). A use of platelet additives solution (PAS) improves the storage conditions thus increasing the shelf life of platelets and maintaining hemostatic function. 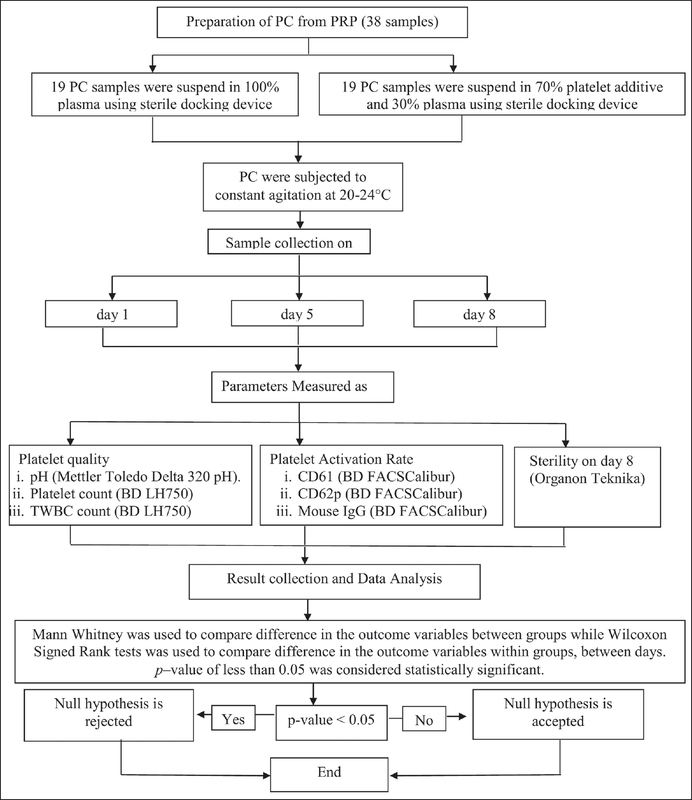 The present study was aimed to compare in vitro quality of PRP-derived PC during the extended storage period in plasma and platelet additive solution (PAS) (Composol, Fresenius) as suspending medium. The quality assessment parameters include pH, platelet count, white blood cell (WBC) count, sterility test, and platelet activation markers such as CD61 and CD62p. The sample size was determined online by the software of Dupont and Plummer  as was used earlier by others. A total of 38 WB units, collected in triple blood bag system at National Blood Center (NBC), Kuala Lumpur, were conveniently sampled for the study. Randomized 19 samples each were taken in the study on the plasma and the PAS as storage medium. PCs were prepared as per the standard laid down by the American Association of Blood Bank (AABB). In brief, the WB units was centrifuged with light spin of 2,200 rpm for 8 min at 20°C, and platelet-rich plasma (PRP) was expressed into the satellite bag intended for platelet. The PRP was further centrifuged at 20°C with "heavy" spin of 3,800 rpm for 10 min, and the platelet-poor plasma was expressed into the second satellite bag. The weight of the PC suspension was kept to 60-70 g. While 19 PCs were kept in native plasma, the other 19 PCs were suspended in PAS (Composol PS, Fresenius Kabi) fortified with native plasma in an approximate ratio between 70:30 and 65:35. For this, an amount of plasma was retained in the bag with the platelet and the amount of PAS was then manually added so as to achieve the desired ratio. The ratio was maneuvered approximately between 70:30 and 65:35 but, as it was done manually, it was not possible to control the exact amount of additive to plasma. The PCs were left stationary at room temperature for approximately 1 h, followed by a slow, gentle agitation to achieve uniform suspension. The PC units were stored in a platelet incubator at 20°C under constant agitation. Sampling was done by stripping the tubing of the PC bag to ensure the uniform mixing of PC. The PC was then collected from the tubing segment into a plain tube (as the specimen was already in an anticoagulated form). All the measurements were done on day 1, day 5, and day 8 of the storage period, except for the sterility test, that was carried out only once on the last day, i.e., the eighth day of storage. The total platelet count and total WBC count were determined using standard calibrated hematology analyzer (Beckman Coulter LH750, CA, United States). The pH was measured using pH meter (Mettler Toledo Delta 320 pH meter). Sterility test was performed using automated blood culture system (Organon Teknika). Platelet activation marker was measured by expression of CD62p marker using flow cytometer (FACSCalibur of Becton Dickinson). The data was analyzed using Statistical Package for the Social Sciences (SPSS) software (SPSS-Inc., Chicago, US) and reported as median and inter-quartile range (IQR). Mann-Whitney test was used to compare difference in the outcome variables between the groups while Wilcoxon signed-rank test was used to compare difference in the outcome variables within the groups. P-value <0.05 was considered statistically significant. The research design, covered to prepare PC from PRP through data collection and analysis, is depicted in the flowchart [see [Figure 1]]. Results are summarized in [Table 1]. According to NBC, Malaysia, guidelines, PCs must have pH >6.5 so as to ensure the quality of platelets components. In the present study, the pH values remained higher than the stipulated values earmarked by NBC, though there was a gradual decline in pH for both PCs suspended in plasma and that in PAS during the storage period. pH of PCs suspended in PAS was also significantly lower in comparison with PC suspended in plasma (P value <0.001) through out storage period. With regard to WBC count, both the suspending medium, i.e., plasma and PAS, showed an acceptable value of being <0.2 × 10 9 /unit during the storage period. Although there was no statistical difference in WBC count in two groups during the storage period of day 5 and day 8, the PCs suspended in PAS showed a lower count as compared to that suspended in plasma on day 1 (P value of 0.011). This would presumably be due to an error in counting of sampling obtained. The median value of total platelet count from both the groups was within the acceptable limit of >60 × 10 9 /unit through out the storage period. However, the total platelet count from the PC suspended in PAS was higher as compared to that in plasma, though the difference was not significant. Both the groups showed increased platelet activation rate during the 8 days of storage. However, the PCs suspended in PAS showed significantly higher platelet activation rate as compared to that in plasma (P value 0.001). Result from sterility testing showed no growth in both the groups, i.e., the PCs suspended in plasma or that in PAS (Composol PS). Platelets separated from WB unit are usually suspended in native plasma or in PAS. The latter maintains the quality of platelets by reducing the PSL. Platelets are stored at 20-24°C under constant agitation in a specially designed incubator for 5 days of blood collection. In Malaysia, guidelines set by NBC  define quality control requirement for PCs to include volume (as 50 mL ± 10 mL), platelet count (as >60 × 10 9 /unit), total WBC count (as <0.2 × 10 8 /unit), pH (as >6.5), and bacterial sterility. The quality control testing usually done on expired PC after 5 days. A pH below 6 is associated with loss of viability so also is a pH >7.4. Cardigan et al. and Gupta et al. observed significantly lower values in pH in platelets preserved in PAS as compared to that preserved in plasma, though the magnitude of difference was well within the acceptable limit. In the present study, we found a gradual decline in pH for both the platelet suspending medium, i.e., plasma and PAS. The pH in PAS was significantly lower as compared to that in plasma (P value of <0.001), though it was within the acceptable limit. Van der Meer  felt that a presence of high amount glucose in PAS should be avoided as it will generate more lactic acid and cause rapid deterioration of pH in PC and had suggested that glucose may be replaced by acetate to curtail the formation of lactate and provide buffering capacity as is oxidized to bicarbonate by platelets. However, plasma, with its natural content of bicarbonate, may serve as good buffer to any change in pH that may take place as consequent to metabolic glycolysis by presence of platelets and residual WBCs. A high residual WBC count in blood product is associated with untoward effects such as febrile non-hemolytic transfusion reaction, human leukocyte antigens (HLA) immunization, transfusion associated graft versus host disease (TA-GVHD) and cytomegalovirus (CMV) transmission to the recipient. It is known that ≥5 × 10 6 WBCs per PC can induce alloimmunization. Thus, a lower residual WBC count is desirable to prevent such nonhemolytic transfusion reactions. In the present study, we found an acceptable residual WBC count median (<0.2 × 10 9 /unit), both in plasma and in PAS. This finding corroborates with observation made by Cardigan et al.,  on BC-derived PCs suspended in plasma and PAS. Van der Meer  obtained a higher yield of platelets suspended in plasma as compared to that in PAS and it was attributed to the lower viscosity of the PAS under given centrifugation conditions. Gupta et al.,  on the other hand, found no significant difference in total platelet count irrespective of the PC suspended in plasma or in Composol. In the present study, the median value of total platelet count from both suspending medium is within acceptable limit of >60 × 10 9 /unit, though the higher values of total platelet count in PAS was not significantly different from that in plasma (P > 0.005). Result from sterility testing showed no growth for both group of PC suspended in plasma and PAS and this observation was line with other studies. Bacterial contamination has been the main concern in extending PC shelf life. Based on this study, it has emerged that the sterility of the PCs can be maintained through the extended shelf life up to 8 days. 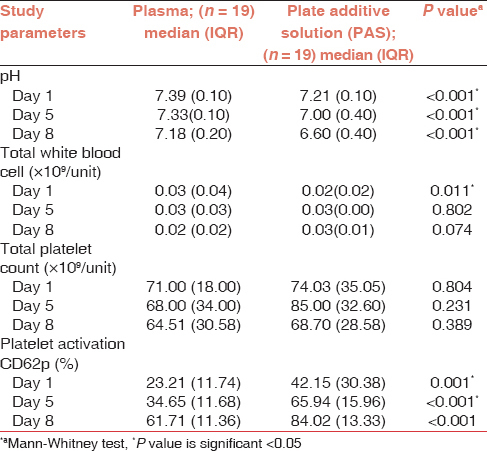 Most parameters studied on platelet storage in suspending medium of native plasma and PAS remained well within the acceptable values, though the pH values and platelet activation rate significantly differed in PAS as compared to plasma. Further study is recommended to define the role of potassium and magnesium as to inhibit the expression of CD62p, the marker for platelet activation and to fortify them appropriately in the formulation of PAS. Based on the results on controlling the platelet inhibition, further recommendation may be made on the use of PAS as a platelet preservation strategy for an elongated period of 8 days. This research was supported by postgraduate student grant from Advanced Medical and Dental Institute (AMDI), Universiti Sains Malaysia, Penang. The authors would like to thank all the staff at AMDI as well as at National Blood Center, Kuala Lumpur for their immense help throughout the study. Cardigan R, Sutherland J, Garwood M, Bashir S, Turner C, Smith K, et al. In vitro function of buffy coat-derived platelet concentrates stored for 9 days in Compo Sol, PASII or 100% plasma in three different storage bags. Vox Sang 2008;94:103-12. Ohto H, Nollet KE. Overview on platelet preservation: Better controls over storage lesion. Transfus Apher Sci 2011;44:321-5. Gupta A, Chandra T, Kumar A. Retracted: Platelet storage lesion: Current proteomics approach. Platelets 2011. Available from: http://www.ncbi.nlm.nih.gov/pubmed/21341971. [Last accessed on 2015 Jun 26]. Ringwald J, Zimmermann R, Eckstein R. The New generation of platelet additive solution for storage at 22 degrees C: Development and current experience. Transfus Med Rev 2006;20:158-64. Dupont WD, Plummer WD Jr. PS Sample Size Calculator, Version 3.0. 1998. Available from: http://www.biostat.mc.vanderbilt.edu/wiki/Main/PowerSampleSize. [Last accessed on 2015 Jun 26]. Technical Manual, 12 th -15 th eds/Standards for Blood Banks and Transfusion Services, 1 st -23 rd eds. Bethesda, Maryland, USA: American Association of Blood Banks; 2005. Gupta A, Chandra T, Kumar A. In vitro function of random donor platelets stored for 7 days in composol platelet additive solution. Asian J Transfus Sci 2011;5:11.
van der Meer PF. Platelet additive solutions: A future perspective. Transfusion Clinique et Biologique 2007;14:522-5. Afifah H. Transfusion Practice Guidelines for Clinical and Laboratory Personnel. 3 rd ed. Kuala Lumpur, Malaysia: National Blood Center, Ministry of Health; 2008. Tynngård N. Preparation, storage and quality control of platelet concentrates. Transfus Apher Sci 2009;41:97-104. Dijkstra-Tiekstra MJ, van der Schoot CE, Pietersz RN, Reesink HW. White blood cell fragments in platelet concentrates prepared by the platelet-rich plasma or buffy-coat methods. Vox Sang 2005;88:275-7.
van der Meer PF, Kerkhoffs JL, Curvers J, Scharenberg J, De Korte D, Brand A, et al. In vitro comparison of platelet storage in plasma and in four platelet additive solutions, and the effect of pathogen reduction: A proposal for an in vitro rating system. Vox Sang 2010;98:517-24. Gawaz M, Ott I, Reininger AJ, Neumann FJ. Effects of magnesium on platelet aggregation and adhesion. Magnesium modulates surface expression of glycoproteins on platelets in vitro and ex vivo. Thromb Haemost 1994;72:912-8.